Oft considered one of TNG’s finest outings, we decided to take a look at The Inner Light shortly after we heard about the new Picard series. After all, this is a Picard episode so why not? Does it live up to it’s reputation? Well… not all of us think so! For this week’s upcoming St Patrick’s Day, the 10Backward crew snuck into 10 Forward and pilfered Guinan’s Guiness stash! 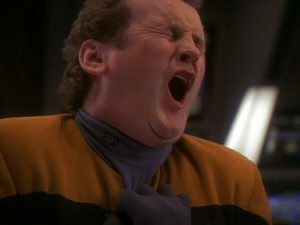 We then legged it back to 10Backward and proceeded to drink the health of Miles Edward O’Brien, because the poor man has suffered… hear what we have to say about him and his stories! Star Trek Nemesis… a much maligned final entry into the TNG film series. Did it kill the franchise? Well, always ones to take a different path, the 10Backward crew attempt to mount a defence for Nemesis. Maybe killing the Franchise is a bit more complex than one film. Maybe there’s other factors affecting the box office. Maybe the story has hidden depths… Do we succeed? Listen to find out!